So You Don't Understand Analytics Jargon? It’s really not that difficult, but today I’m going to do a quick breakdown of the terms used on the Google Analytics overview that we send to our clients each week. If you log in to your account though, you will find this under Audience > Overview in the left menu. 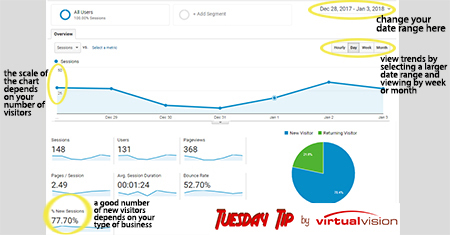 You will see a chart of how many visitors you had to your site each day in the last week. You can change that time frame in the upper right of the chart. You can also compare one time period to another. Sessions – This is how many total visits the site had. Users – This is the number of unique people who visited the site. Some may have visited several times which accounts for the larger number of sessions. Av. Session Duration – Average amount of time each visitor spent on the site. Bounce rate – The percent of visitors who left the site after seeing only one page. A high bounce rate is usually bad, but if most of your visitors are going to the first page to get your phone number, calling you, and leaving the site, that is definitely okay. % New Sessions – the percentage of visitors that are new to your site. The number you want will depend on your business. If you are building houses, you wouldn’t expect many repeat customers, but a restaurant would. Think about your business and the numbers you would expect to see for new versus returning visitors. If your bounce rate is over 70%, then changes to your website may be in order. Virtual Vision is here to help.